Picture this: You’re hungry and you pull up to your favorite restaurant, only to discover that it’s closed for renovations for a few months. Your stomach grumbles. Your chicken sandwich dreams begin to fade. That is, until you notice another restaurant beside it is made from… shipping containers? That’s exactly what happened after the Newnan Dwarf House closed its little red door on March 24. A staple of the Atlanta suburbs, customers around Chick-fil-A’s hometown are no stranger to the 11 Dwarf House restaurants, an homage to Chick-fil-A Founder Truett Cathy’s original restaurant in Hapeville, Ga.
A disappointment that was hopefully short-lived, thanks to a creative solution from Chick-fil-A’s innovation team: a temporary restaurant made from shipping containers. 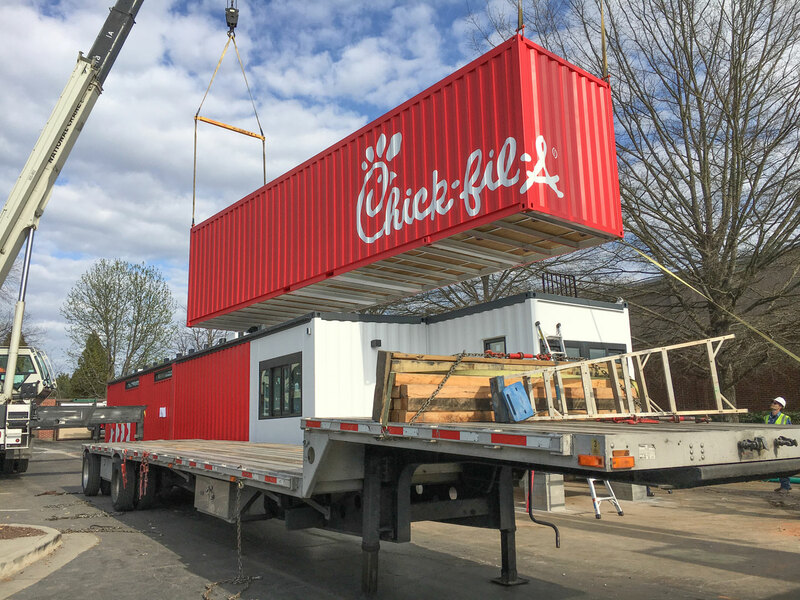 “It took six days to assemble the shipping-containers restaurant for the first time, but we plan to get that down to two days,” says Luke Pipkin, who leads the project on Chick-fil-A’s innovation team. The temporary location, which opened for business on March 31, serves nearly two-thirds of the normal Chick-fil-A menu through a drive-thru window. (Waffle fries? Milkshakes? Breakfast? Yes, yes and yes.). It is built from five different shipping containers, each of which are specially made for Chick-fil-A. They are taller and wider to create a more comfortable kitchen space for up to 24 team members at a time. And for Burgess, there was another bright side to the new solution. “We were able to retain 100 team member jobs while waiting for our new restaurant to open,” he says. The shipping-containers restaurant will be in Newnan, Ga. for approximately three months before it is deconstructed (in a single day! ), and rolls on to its next stop.